The German Army marching into Neu Sendec during WWI. Bundesarchiv. The outbreak of World War I in 1914 was greeted by a wave of nationalist fervor all across Europe. When Germany enthusiastically rallied as one behind Kaiser Wilhelm II in a “civic truce” [Burgfrieden], German Jews were hopeful to finally claim their rightful place in German society as equal citizens by demonstrating their loyalty and patriotism. 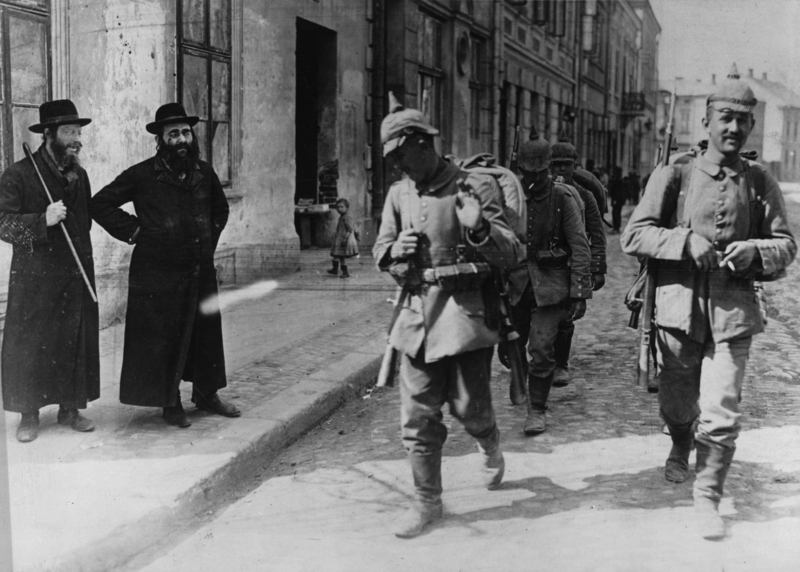 Although the enthusiasm for WWI was not entirely unanimous among Jews, the idea of freeing East European Jews from Czarist oppression was welcomed by all. Against this backdrop, and after re- encountering the “authentic” and multifaceted culture of the Jewish shtetl, many German Jews then questioned whether assimilation at all costs was actually a desirable goal. The specifically Jewish war experience became an important factor in a burgeoning of Jewish activities during the 1920s, which ranged from a renewed interest in Jewish religious matters to a new interest in secular Jewish culture, including the visual arts and literature. This exhibit explores these themes through original correspondence, photographs, artworks, and objects from the collections of Leo Baeck Institute.